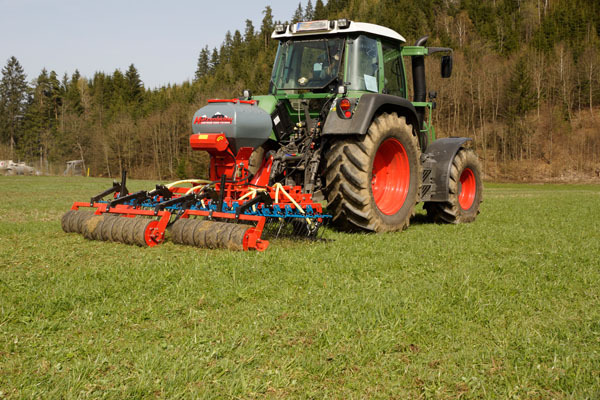 The "Hatzenbichler-Vertikator" is the implement suitable for the renovation of the grassland without ploughing, especially, if the renovation of the turf, including over-sowing is done in one pass. The grassland harrow in connection with leveller bars make a perfect combination to level mole hills, breaking down of manure and airing of the turf. The flexibility of the harrow sections, fitted with spring tines, allows the best adaptation on the ground and therefore all the uneven parts on the fields are touched. By the specially shaped tines with Hatzenbichler vibration effects (precession), which can be adjusted in various different positions, a very high Efficiency for the control of mossy and weedy aereas can be achieved. Through this cleaning the Turf is again better supplied with air and water. The Special Suspension with stabilizer blade edge toothing allows a good distribution of molehills while setting reset reset of the earth into the ground. Also to distribute and rubbing dung, cow dung and manure is the best suited and levelling plates to level trampling by cattles. The seed is discharged in Hatzenbichler seeding unit just above the ground over baffles between the third and fourth ros of tines. It ist important that the seed penetrates the previously torn with the tines of the ground, while the same is given the desired ground circuit. By the previously well-ventilatd and cleaned of grass matting creates an excellent seedbed for fresh seeds, which can develop through good supply of air and water well. Grassland harrow with pneum. seeding machine optionally with "Air-8" or "Air 16". The special pressure rollers (Farmflex roller) behind the harrow and the pneumatic seeding machine complete the perfect pagination loose pasture renewal. The more divided pressure roller presses the seed and give good soil contact. 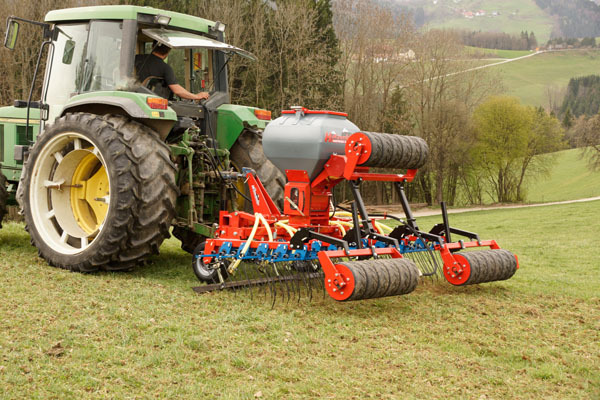 The Farmflex roller is characterized by excellent ground Adaption even on the most difficult Terrain. Even in wet conditions - no sticking of the rolls. Pneumatic seeding machine "Air 8"